please make an appointment to see Dr Ly personally now! Call 877-6526 or CLICK HERE--don't wait! Dr. Ly is a board certified Dermatologist and specializes in general adult, pediatric and cosmetic dermatology. 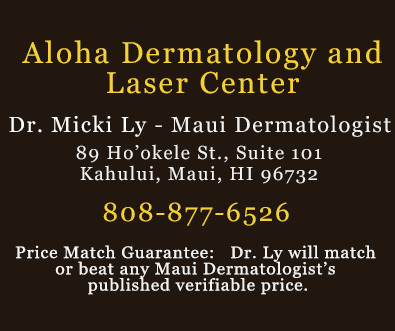 Our mission at Aloha Dermatology and Laser Center is to enhance the lives of our clients and the Maui community with the latest medical therapies that are proven to be safe and effective solutions against skin diseases, including skin cancer (detection, management and care), that jeopardize human health and well-being. Skin tags (acrochordons) are small, unsightly, growths of skin that individuals develop around the eyelids, neck, armpits, and the groin areas. Typically they look like small little balls of skin attached to the body by a thin stalk. The vast majority of moles or nevi do not require removal. Those prone to irritation, or certain lesions which evidence change concerning for abnormality or possibly melanoma should be evaluated by a dermatologist and removed in the appropriate fashion. Many patients seek removal of nevi for cosmetic reasons as well. Surgical scar revision involves removing the entire scar surgically and rejoining the skin. Although a new scar will form, the goal of the surgical technique is to create a less obvious scar. Surgical scar revision is usually reserved for wide or long scars, scars that healed in an unusual way, or scars in very visible places. A common skin disease that causes redness and swelling on the face. Often referred to as "adult acne," rosacea may begin as a tendency to flush or blush easily, and progress to persistent redness in the center of the face that may gradually involve the cheeks, forehead, chin, and nose. It also may involve the ears, chest and back. As the disease progresses, small blood vessels and tiny pimples begin to appear on and around the reddened area; however, unlike acne, there are no blackheads.